STOCKHOLM -- Sweden's Debt Enforcement Agency will start a collection process against Saab Automobile on Wednesday and could freeze its assets, unless the cash-starved carmaker pays two suppliers about $620,000, an official at the regulator said. "The collection process that may start tomorrow would include investigating Saab's bank accounts and potentially also other assets," which could mean freezing them pending payment, Hans Ryberg, a division chief at the state agency, said on Tuesday. The companies that Saab must pay on Tuesday to prevent the start of the procedure are Kongsberg Automotive AB, a Norwegian manufacturer of car-seat parts, and Infotiv AB, a Sweden-based consulting firm, Ryberg said. The "big majority" of the money is owed to Kongsberg, he said. Saab was forced to halt car production in late March because of a cash shortage, and the assembly line has been quiet since early June. The company is trying to raise more funds and has said it aims to restart manufacturing in a few weeks. Swedish Automobile NV, Saab's Dutch owner, raised money on Monday by selling 4 million new shares to GEM Global Yield Fund Ltd. "We're of course totally aware of this situation with the collection agency, but I can't comment on what we're going to do," Eric Geers, a spokesman at Saab, said on Tuesday. Joachim Magnusson, head of Kongsberg's auto division, and Hans-Jorgen Morland, a spokesman at the Norwegian company, didn't immediately reply to voicemail messages seeking comment. Infotiv CEO Alf Berntsson didn't immediately reply to a message left with a secretary. 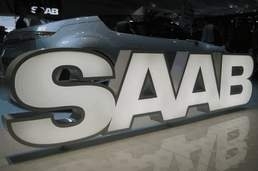 More than 100 debt claims against Saab have been filed with the collection agency, with some companies filing more than one claim, and eight proceeding to ask for the regulator's involvement, Christina Lindberg, another agency official, said last month. Ryberg said he doesn't know the total amount that Saab owes. Another 5.1 million kronor ($792,200) is due to more suppliers in about a week, he said. The collection process usually takes from one to three months, and can be halted in the event Saab pays the debts involved, Ryberg said. At the end of the procedure, the Swedish tax authority can request that Saab be put into bankruptcy unless the manufacturer has paid the debts, he said.